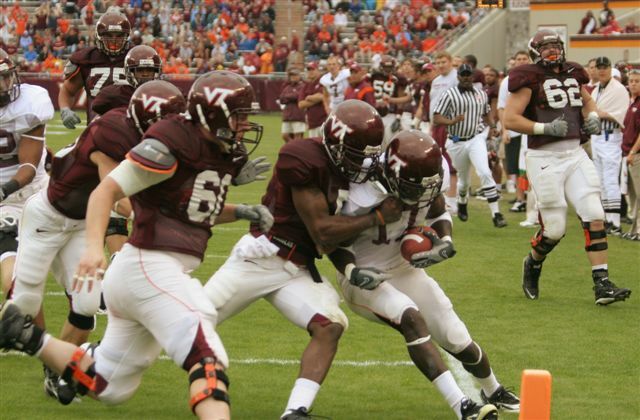 This entry was posted on April 21, 2008 at 2:51 pm and is filed under In Tyrod we trust, Kam Chance is the bomb, Macho Macho man, Vince Hall owns your soul, Virginia Tech football. You can follow any responses to this entry through the RSS 2.0 feed. You can leave a response, or trackback from your own site. OK, let me go ahead and address this one. 1) Yes, our passing game was horrendous and it has been for some time now. It isn’t that we don’t have talent at the receiver position, it is because we don’t use them. Who is at fault there? Certainly not the players, but in fact our coaches (i.e., Stiney and Beamer) because they are the ones who call the plays. 2) It doesn’t matter how you did in college, though it certainly doesn’t hurt. Scouts saw the potential in Royal, Morgan, and Harper, which is why they were selected in the NFL draft. They saw it in the games they played and they saw it in combines. 3) Again, the combines do a lot for players who are not utilized like they should be during their college careers. Many experts and scouts said that Morgan could have been a phenomenal receiver if he were in the right offense. Royal wasn’t used effectively until his senior season, and Harper just never got a huge chance to shine. In closing, I will reiterate that our passing game was quite anemic and it continues to be that way (hopefully that will change), but it’s not because of the players, it’s because of the plays called. We always have fantastic talent, but sometimes we just don’t use them appropriately. The best analysis I’ve heard about QBs vs. WRs is that a great quarterback can make it happen with mediocre wide outs. Our passers are not strong. Even “Him Who Should Not Be Named” had an NFL WR in Andre Davis and still had a weaker passing game. Also, UVA puts a ton of guys in the draft. A ton of guys that spend more time in Idaho than they want to.